It has been several years since the first rumors of Google's cloud storage service "Drive" started popping up, but for quite a while we didn't see any of them come to fruition. Just last month, however, we saw a leaked screenshot showing off the Drive logo and its interface, leading us to believe that an official launch wouldn't be too far off. 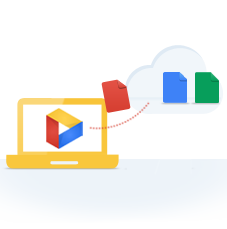 According to GigaOM's sources, Google plans to launch Drive in the first week of April, offering users 1 GB of storage space for free, with a charge for any more storage; rather paltry compared to Dropbox's free 2 GB of storage. One feature that Drive may include could blow Dropbox away entirely, though: an API that allows third party apps to store data within Drive. This may be a key feature in Drive's integration with Android - imagine if all of your apps could back up their data and restore it when you switch to another device? Remember to take these features (and more importantly, the launch date) with a grain of salt, as they are still just rumors, albeit very believable ones. Google has been taking its sweet time launching Drive, so don't be surprised if we have to wait a bit longer than expected again.